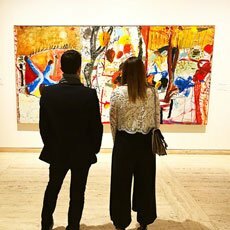 The Young Members program connects like-minded individuals to the many facets of the art industry while fostering a relationship with one of the most prestigious cultural institutions in Australia, the Art Gallery of NSW. The Young Members program is managed by staff from the Art Gallery Society of NSW, supported by the Young Members advisory committee and a group of volunteers. We always welcome new faces and fresh ideas. If you’re interested in joining in as a Young Members volunteer, ensure you are a current Gallery member and simply send an email to info@artgallerysociety.org.au. We’ll contact you with all the details you need.